The Mother of all Churches, Cathedrals and Basilicas of the Philippines. The Manila Cathedral-Basilica is the Premier Church of the Philippines because of all the Churches in the archipelago, it was the one chosen to become the Cathedral in 1581 when the Philippines was separated from the Archdiocese of Mexico and became a new diocese with its episcopal seat in Manila. As the Church of Manila, it was established by the secular priest Juan de Vivero in 1571 under the patronage of Mary, La Purissima e Inmaculada Concepcion. Fr. Vivero was given the special privilege and sole faculty by the Archbishop of Mexico to take care of the spiritual welfare of the new Philippine colony. The Manila Cathedral-Basilica is the Premier Cathedral of the Philippines for the obvious reason that it is the first Cathedral of the Philippines. The Manila Cathedral-Basilica is the Premier Basilica of the Philippines because among the Churches in the Philippines it is the only one elevated to the rank of a Basilica by the Pope’s own initiative (motu proprio). All other Churches in the Philippines became a Basilica due to the initiative of the local Church where it is located. His Holiness, Pope John Paul II, now a canonized Saint, raised the Manila Cathedral to the dignity of a Basilica (motu proprio) on April 27, 1981, two months after his first visit to the Philippines in February 1981. 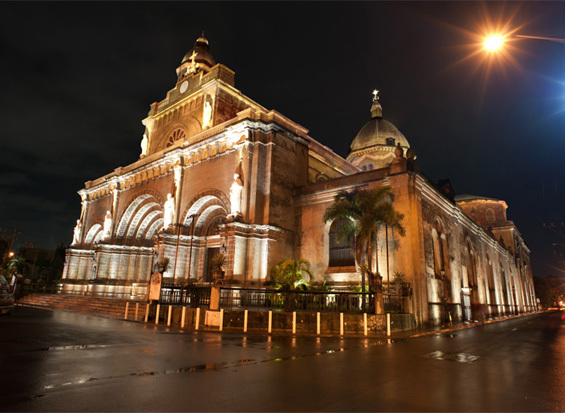 As the Premier Church, Premier Cathedral and Premier Basilica, the Manila Cathedral-Basilica is the Mother of all Churches, Cathedrals and Basilicas in the Philippines. The devotion to the Holy Souls in Purgatory has been a practice in the Manila Cathedral for centuries. This is evidenced by the inclusion of a Chapel dedicated to the Holy Souls among the several chapels incorporated in the rebuilding of the Manila Cathedral every now and then after being destroyed either by fire or earthquake or typhoon or bombings like what happened during the Battle of Liberation in World War II. The earliest available record attests to the inclusion of a Chapel dedicated to the Holy Souls in the third structure of the Manila Cathedral, whose rebuilding was completed in December 1641. 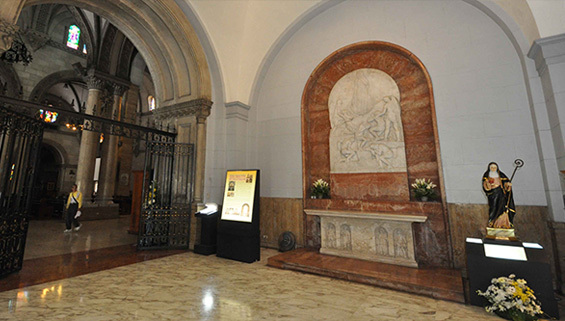 The Chapel which was called “Souls in Purgatory” was donated by a certain Capitan Antonio de Espinosa and his wife Maria de Riaga (Maria Acriaza in other books), a descendant of one of the oldest families in Manila. The present structure of the Manila Cathedral, the eighth (8th) and the Post-War reconstruction designed by Archt. Fernando Ocampo, has eight (8) chapels. One of them is the Chapel of the Blessed Souls in Purgatory, where you are now. It is now referred to as the Chapel-Shrine of the Holy Souls in Purgatory. It is a Chapel-Shrine de facto because it is a living testimony to the devotion to the Holy Souls in Purgatory, which started in the Manila Cathedral in the past centuries and has continued to the present day through the Prayer Warriors of the Holy Souls. The Chapel-Shrine has a marble altar piece by the Italian Giuseppe Perischetti. It has a unique marble relief that depicts the souls in Purgatory assisted by holy angels, raising their prayer to Mary, as refugium peccatorum (refuge of sinners). Moreover, it shows the saints whom Liturgy invokes in the commendatio animae (commendation of the soul): St. Michael the Archangel, St. John the Evangelist and Sts. Peter and Paul.